Our applicant Patrick is an ardent Arsenal fan and thanks to our ambassador Sarah he had a double surprise this week. 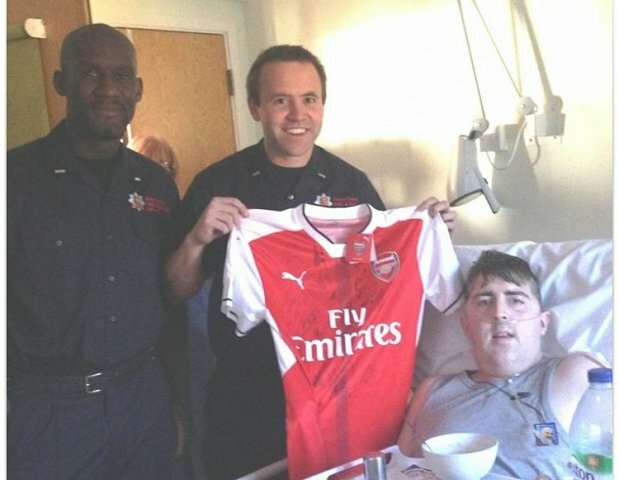 Sarah arranged for the Arsenal squad to sign a home shirt and trustee Gary delivered it to him at St Luke’s Hospice in Basildon. Once Patrick had recovered from that nice surprise he was handed another as we had also been able to secure tickets for a forthcoming Premier League game. Big thanks to Sarah, Gary and his colleagues at Basildon Fire Station and enjoy the game Patrick.